In the early 1950's Ryuzo Omosako began selling and trading Koi and goldfish at his business site located in Kure, Hiroshima. Now today Koi are shipped by plane in a box with plastic bags filled with water, chemical additives, and medical grade oxygen. However, back in the 50'Sgetting Koi from one part of Japan to another was quite difficult at best. Ryuzo would drive his truck from Hiroshima to Niigata using only small roads, as there were no highways at that point. This 24 hour drive would take him up to the villages near Ojiya, which at the time had only dirt paths. Koi would then be loaded into aquariums he had mounted to a trailer that he pulled back down the mountain. You can only imagine the disaster that may have occurred if Omosako san hit a nasty bump on his way back down south. He would then sell these colorful carp to Koi keepers in Hiroshima, and as a result the Omosako Koi farm was born. In 1974, after having great success in selling Koi, Ryuzo and his son Takashi (20 years old) decided to begin breeding Koi on their own. They built a farm in Tochibara and began breeding many varieties, Gosanke and Hikarimono alike. In 1980 the Omosako family stumbled on a Shiro Utsuri that they thought might make a very nice Oyagoi (female parent). For its day it had incredible Sumi and great white and they hoped the genetic material would transfer to her offspring. Omosako's hunch was correct and the offspring became ve:y popular amongst the Koi community. Soon after, these baby Shiro were entered into Koi shows around Japan and took many small prizes. This attention was enough to bring Japanese Koi dealers to visit this small farm in Hiroshima to see these special Omosako Shiro Utsuri. Over the next 10 years Omosako became aname synonymous with Shiro Utsuri. The bloodline becoming more established and the word of the Omosako family's treasure becoming better known, and the family was pleased with their accomplishments. There was, however one very big problem ...While their Shiro Utsuri were elegant Koi that displayed ideal properties ofSh iroji and Sumi, the Koi community would never take them else was just "nice". At the time Shiro Utsuri wouldonly look descent at 60cm124in, and when they reach full size their bodies would balloon up and look like football (the American kind). With many ofthe breeders focusing on large Gosanke, Omosako felt it was his duty to go against the grain and create jumbo Shiro Utsuri. The quest for a new female to add to the bloodline was realized in 1992 when the Omosako family stumbled on Tatsuma, an 84cm/32%in Shiro Utsuri with perfect body conformation. The number of quality Koi to come from the spawning ofTatsuma and the Omosako bloodline is truly incredible. Extract from Koi Nations magazine. I read on other forum that the keepers are speculating that Omosako did some cross breeding with kumonryu about 15years ago to transfer the diffirent type of white gene of the kumonryu over to the shiro utsuri. Shiro Utsuri apparently always had translucent type of white but in the last few years it has become a pure, pure white. They also refered to the head pattern of the shiro utsuri that has also changed too a much more flowy type pattern or too a more bald head. 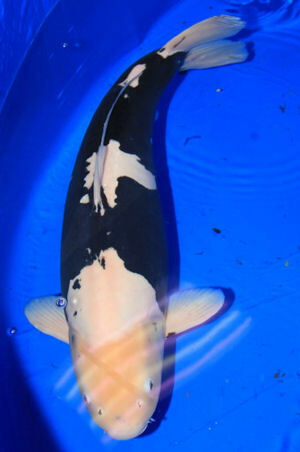 Here is a picture of a kumonryu, i can almost see what the koi keepers on the other forum ment. For those that are intrested, here is a excellent document regarding a talk that was done by Takayoshi Omosako at SPKC. Thanks for all the interesting info. I can see that you are a Shiro fan. Koi would then be loaded into aquariums he had mounted to a trailer that he pulled back down the mountain. The transport of koi by Omosako reminds me of an article in the Burger during 1988. Deur HANNES MALAN, Stadsverslaggewer 'n GOUDVISSIE is 'n rustige dingetjie om in 'n sitkamer aan te hou. Baie mense sal voel die ou goedjies se rustige bewegings streel hulle in die gejaagde stadslewe van vandag. Hier kom nou 'n kans om enetjie aan te skaf. Die Kaapse stadsraad verkoop môre-oggend in die Kompanjiestuin hul oortollige goudvissies. Die verkoping begin om 9 vm. en geskied in die geurige atmosfeer van die roostuin. Jy sal jou lengte en kleur kan kies - byna soos gordyne in 'n nuwe huisvestingsprojek - en glo teen billike pryse. Maar jy sal nie meer as drietjies kan koop nie. [b]Vissie-liefhebbers moet hul eie houers saambring. Miskien sal 'n groot plastiekemmer geskikter wees as 'n glasbolbak wat so maklik breek. As jy van groot Japanse koi's hou - van so 300 mm - sal jy R70 stuk moet uithaal. Groteres kos R100. As dit duur klink, onthou: in winkels kos die pragvissies baie meer. Die koi is die soetste troeteldiertjies, omdat hulle so mak word. Hulle eet uit jou hand. Jy kan 'n koi ook leer om nader te swem, sodat jy sy kop kan krap. So stil-stil kan 'n koi tot 'n meter lank word en naderhand 10 kg weeg. Hulle word oud en nuuskierig en hou jou altyd uit die water dop. Elke jaar wanneer die visdamme skoongemaak word, word goudvissies verkoop. Gewoonlik in September, maar vanjaar vroeër, om hulle 'n langer broeiseisoen te gee. In die verlede het kinders en ma's en pa's byna oormekaar geval om vissies te koop. Kom dus vroeg, want baie kopers is ook vistelers met baie geld. Heel klein goudvissies van sowat 75 mm (3 dm) kos R3 50 stuk; middelslag van 75 mm tot 100 mm (tot 4 dm) R5,50 en grotetjies, van 125 mm (5 dm) en groter R7. Die klein koi'tjies van sowat 75 mm kos ook R3,50 stuk en middelslag (75 mm tot 100 mm) R5,50, maar die groteres, wat al baie nuuskierig is, haal (300 mm) R70 elk. Die heel grootste makkes van langer as 300 mm kos op hul nuuskierigste R100 stuk. Die vissies wat verkoop gaan word, is gister gevang. Party word gehou en vir hulle word die spuitfonteine ook sommer skoongeskrop en waterlelies oorgeplant. Soms word party uitgeruil om nuwe bloedlyne te kry, want met te veel inteling kom altyd probleme - wie wil nou 'n vissie hê wat jou nie uit pure nuuskierigheid dophou nie? En wat gaan jy maak as 'n koi na jou vinger hap as jy hom vir 'n krummeltjie middagete nader roep? Shiro Utsuris have always been my favourite followed by sanke but due to koi shows i tried mainly gosanke. Since i lost all my koi last year due to ulcers i decided to now try and only keep Shiros....it sounds a bit boring but if one is going to compete at koi shows one can not keep gosankes and shiros together in one pond. Gosanke needs colour enhancer otherwise they look orange and not red they also need soft water otherwise they develop shimis. Shiros Utsuris again needs no colour enhancer or they will develop hi spots. One must remember that Shiro Utsuri historicaly comes from showa so feeding colour enchancer will bring some hi back. Shiro Utsuri also need hard water with a higher calsium content or they develop sumi that stays underlying which appears gray. In softwater one could wait forever for sumi to surface. I cant promise that i wont have 1 or 2 gosanke but im going to try and specialise in shiros from now on. I have already acquired 3 tosai with omosako bloodline and Bobby has donated his Supreme Size 3 Shiro Utsuri female which comes from knysna koi farm to me which im going to try breed with in the furture. The only shiro utsuri bloodlines worth looking at in my opinion is Omosako and Kaneko. Note that i say bloodlines and not breeder. There are a few koi breeders breeding with omosako breeding stock which will give the same caracteristicts as true omosako. I am also going to see if i can get a few shiro bekkos, so as you can see im doing a bit of research. If I'm correct Shiro Utsuri was developed out of Ki Utsuri that came from Ki Bekko. 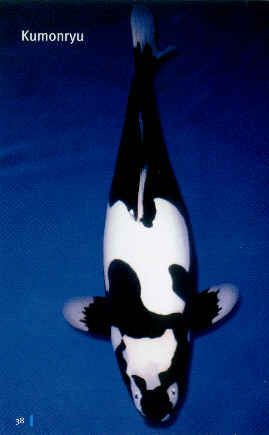 Showa was developed out of cross breeding Ki Utsuri with Matsukawabake and the hi was finally improved through inter breeding with kohaku. Ogata also produces very nice shiro utsuri at the moment. Thank you for the correction ernst, Living Jewels states that alot of Shiro Utsuri are bred from showa and that that is where the tobi hi comes from but that ofcourse does not mean that that is where type originated from so you may be correct. As the shiro utsuri bloodline gets more refined the tobi hi should dissappear....i hope. While showa is on the subject i read that Omosako is now starting to breed with showa aswell. PM me the details for when on sunday. What type of suprise? Some photos on forum please.... Fish and pond. I see we lost the link stated above so i decided to paste the question and answers below. 1. How does Sumi appears, it is by chance? sumi coming out from the head but not on the body. 2. How do you know if a koi is good? come naturally for our Shiro Utsuri. 3. At what age does sumi stabilizes? comment on feeding colour enhancing food such as spirulina. can do well even with color food. 5. How do you choose a good tosai? Shiro Utsuri is a variety that is difficult to predict thus culling is a daunting process. fundamental characteristics of a better koi. 6. It was said that higher pH keeps good sumi. Please comment. being of the koi, the rest will develop naturally.